This chapter introduced the first amniotes and described the adaptations that led to their dominance of terrestrial environments by the time of the Permian Period. 1. Prior to the appearance of amniotes, all tetrapods reproduced in the water. 2. An amniote protects the embryo of its offspring within the sealed environment of an amniotic egg. Amniotes include all reptiles, mammals, and birds, but do not include fish and amphibians. 3. 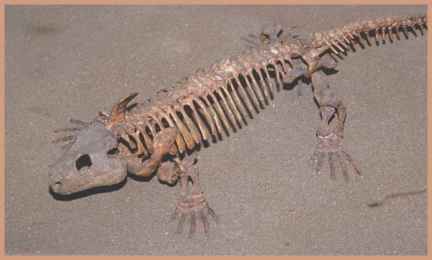 The amniote reproductive strategy eliminated the need for tetrapods to return to the water to breed, an important part of making them fully terrestrial. 4. The earliest known reptile is Hylonomus, from the Middle Carboniferous of Nova Scotia; it dates from about 310 million years ago. 5. Early amniote jaws were an improvement over early amphibian jaws, providing a stronger bite and the ability to squeeze the teeth together to cope more effectively with hard-bodied prey such as insects. 6. The design of the backbone of the first reptiles provided support as well as lightness and flexibility, differing in significant ways from the skeletal features of amphibians from the same time. 7. Early reptiles had stronger ankle bones that also provided better orientation of the foot for walking on land. Period, basal amniotes had already begun to show adaptations leading to their branching into four distinct clades of amniotes. The distinguishing features of these four groups are many, but they begin with a simple distinction in the design of the animals' skulls. From these four groups arose all of the terrestrial vertebrate families known today. This chapter reviews the rise of the four main groups of amniotic vertebrates that closed the Paleozoic Era and led to the rise of reptiles as the dominant life-form of the Mesozoic Era.